A racehorse purchased for a mere $200 and named after one of the owner’s boat could be sailing to victory at Coffs Harbour’s Country Showcase meeting on Thursday. Wauchope trainer Colt Prosser has four horses entered at Coffs including Sunsout Shirtsoff in the Class 1 Handicap (1300m). “They’re a new bunch of owners and managed to get the horse quite cheaply. He is named after one of the guys’ boat,” he explained. Sunsout Shirtsoff is resuming since last running at Tuncurry in September when unplaced. 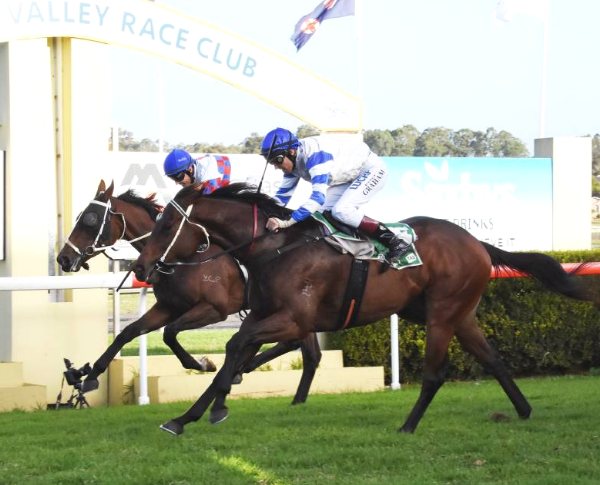 Previously the five-year-old had led and kicked strongly to win over 1900m at Kempsey on August 25. Prosser also has the promising Haames entered for two races but will play a waiting game before deciding on a start. The gelding has only raced on ten occasions for two wins and four placings, including two efforts at Rosehill Gardens where he finished third and fourth in Highway events. “This is a very good horse, but he pulled up with a stone bruise after trialling the other day,” Prosser said. “I’m tossing up whether to run him at Coffs; we’ll see how he fares over the next few days and look at the nominations before deciding if he starts. “The plan is to run him at Coffs and then head to town for a Highway race. He’s been a bit immature, but Blake Shinn rode him at Rosehill and said he’d get over 2000m. Prosser’s Stop the Fight has had two runs back from a three-month break and the trainer warned to expect a sharp improvement from the mare. Last start the six-year-old finished fourth at Port Macquarie: “She was in season and obviously not herself that day. She’ll perform much better on Thursday,” he added. Stop the Fight has won five races with Peter Graham winning four times and he will again take the reins in the Benchmark 66 Handicap (1200m). Prosser’s other runner will be Manning Treasure in the Class 2 Handicap (1000m) with Peter Graham also riding. The mare has run seconds at Port Macquarie in two of her past four starts and is rarely far away. Coffs Harbour’s Racing NSW Country Showcase meeting will provide nearly $250,000 in prizemoney with free entry. Coffs Harbour’s Race Club Manager, Tim Saladine, said: “There are three musicians performing live throughout the day, so we should attract a sizeable crowd. “Further down the track, we have our 13th annual Pink Silks Raceday on January 13 with the Trust having raised well over $750,000. There’ll be live music, jumping castles and a face painter for the children. “There is a ‘pink’ dress code for the Fashions on the Field, including kids’ categories, raffles and pink silks merchandise.